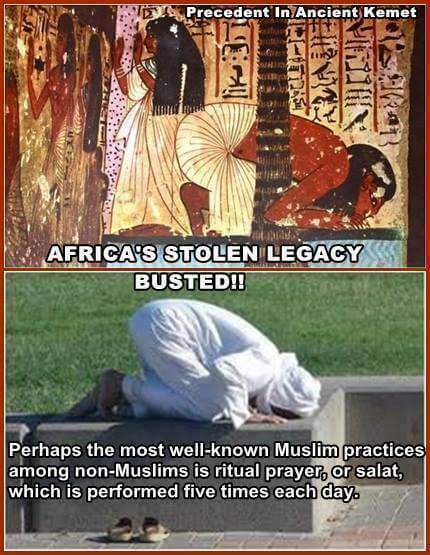 There are a few pictures circulating on the internet such as this to the left, making the claim that the Muslim’s Sujud prayer position is stolen from Kemet. Such pictures with this comparison are misleading and inaccurate. Although the two pictures appear alike, the top figure is that of a Kemetic person drinking water from the edge of the pond under the shade in the Necropolis or Underworld. The bottom figure is that of a muslim in the position of Sujud performing prayer. For the muslims, the act of prostration during prayer preceades Islam and was already part of the tradition in Judamism and Christianity where you will find many biblical references of prophets falling on their face and praying. As we can see, the claim that muslims “stole” their prayer or position of prostration from Kemet is misleading. There is no reason why muslims would need to go to Kemet to steal prayer positions when they are documented in previous scriptures that muslims are told to go back and refer to. As for the Kemetic figure, we see a man kneeling at the edge of a pond drinking water under the shade of a palm tree in the underworld. This picture is common and found in various tombs as portions of the Pert Em Heru aka The Book of the Dead. This particular scene is from a chapter within the Pert Em Heru called “Chapter of Drinking Water in God’s Domain.” This theme is also found in Coffin Texts (Spell 359) where there is a focus on drinking water not to get burnt by the fiery lakes in the underworld. The recital of Chapter LXIII enabled the deceased to avoid drinking boiling water in the Duat. The water in some of its pools was cool and refreshing to those who were speakers of the truth, but it turned into boiling water and scalded the wicked when they tried to drink of it. Chapter for drinking water in God’s domain. May the great water be opened for Ausar, may the cool water of Djehuty and the water of Hapi be thrown open for the Lord of the horizon in this my name of Pedsu. May I be granted power over the waters like the limbs of Setukh, for I am he who crosses the sky, I am the lion of Ra, I am the slayer who eats the foreleg, the leg of beef is extended to me, the pools of the Field of Reeds, limitless eternity is given to me, for I am he who inherited eternity, to whom everlasting was given.